CCSCA Inc. depends on dedicated volunteers to achieve its goals, and in return, volunteers gain valuable experience and leadership skills. We currently serve over 2000 nutritious meals per month, but without enough volunteers, some seniors remain out of the loop. As you may or may not know, many seniors and individuals in Calhoun County depend on Calhoun County Senior Citizens Association to deliver a hot meal to them daily. We are able to do this through the efforts of those volunteers who unselfishly put in countless hours to assure meals are delivered to those in need. However, our volunteer base is limited and our Meals on Wheels program is in desperate need of volunteers to assist in delivery of meals. There are several routes within Port Lavaca and the surrounding area that need meal delivery drivers. In most cases, we are talking about a turn-around time of less than one hour, with the longest delivery route being the Seadrift area which could take up to 1 1/2 hours depending on individual driver speed and weather conditions. Meals on Wheels was recently featured in our local newspaper. Click here to read more. If you or someone you know would consider helping Calhoun County Senior Citizens Association in their endeavor to provide dependable meal delivery service to those that are unable to provide for themselves and depend on the meals we provide, please call (361) 552-3350 today! Your efforts and support would greatly enhance our efforts to deliver meals in a more timely and efficient manner. A criminal background check and good driving record is required. Training and route familiarization will be provided. A volunteer application and background check form can be picked up at the Heritage Center front desk, or you may print the forms on your computer and submit them in person once you've filled them out. 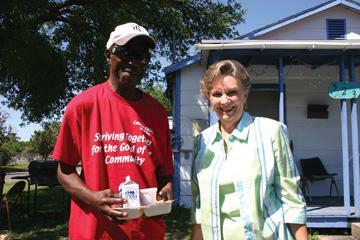 Meals on Wheels volunteer brings a hot meal and a smile to a Port Lavaca senior resident. In order to provide families with budget-friendly prices at the Outpost Resale Shop, someone has to help with sorting through the boxes, laundering the items, shelving and hanging the items, customer service, assistance, and cleaning. It is because of the altruistic efforts of individuals that the Outpost can keep its prices so low, and right now the Outpost is in need of volunteers. If you are interested in being a part of the wonderful team at the Outpost, please fill out a volunteer application and background check form. These can be picked up at the Heritage Center front desk, or you may print the forms on your computer and submit them in person once you've filled them out.